What should be the board settings for this? I am new to electronics please help me how can I connect this with Arduino. There are some fake Modules on eBay! Only after changing the wiring can you use them. The fake modules have the wrong text printed on it. But when you change the wiring you can use the shield! 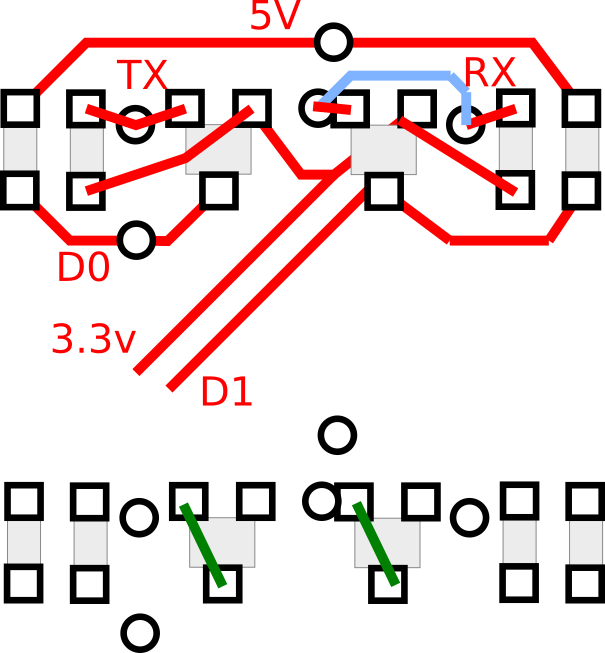 The two transistors which are connected to Arduino board pin 0 and 1 have to disconnected. Also the connection to the switches 1 and 2 have to change. Then you can stack ESP-12 shield on the Arduino. You can now flash the Arduino Uno when you switch off (switch 1 and 2) With the old wiring you can't use it because the transistors are wrong connected. For connection to the Arduino, just stack the shield over the Arduino board. Hi! Finally back here, more enlightened! :D I have finally done some stuff with the 8266 shield. I just wanted to share it with you all. Since I know I wanted all this before I started. I write all this a little bit as a "for dummies" just to make sure every step is included. So to be more precise, I use a Arduino uno with a (se below). There a 4 DIP switches on this board are numbered from 1-4. To be honest I really don't know what 1 and 2 is. But my guess is that you can use TTL levels on TX & RX opposed to 3.3 which the 8266 module uses directly. These two are always set to DOWN for me. Second though, if so, I might set them to UP when using Arduino. I usually play around with the board with a USB to 232 converter when testing. The other two, 3-4, are connected to GPIO 0 and something else xD. I really doesn't matter really. All I know, that I set these to UP to start a firmware update. Here is a good link that might be somewhat equal to what the shield has implemented. 2: (using Arduino with the shield) So everywhere, including this thread states that Arduino UNO doesn't handle the software emulated serial very good at high speeds. That is true :D So I got it to work perfectly with a baud rate 9600. What I did was to find a firmware that has default baud rate 9600 from AI thinker. I never really got the baud change to work. AT+CIOBAUD=9600 never got stuck after a reset (rst button och a AT+RST). And the other AT+IPR=9600 broke the firmware. If someone got this to work, please write here in this thread!! The only wiring I did to make it work, is to connect the tx and rx to Arduino's pins. (rx->tx and tx->rx). 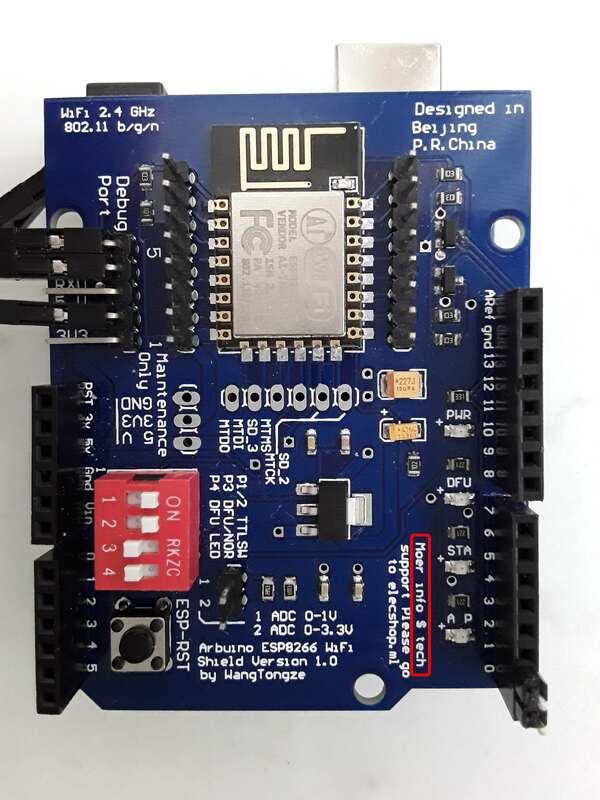 According to this example: http://allaboutee.com/2014/12/27/esp826 ... d-circuit/ connect to pins 2 and 3. The tx and rx from the 8266 shield are located on the left down side. There are other pins you can use also. Because you can't really do any setting with it and it has worked 100% of all time for me and my use. (pins down) from left to right you have: dtr, rx, tx, vcc,cts and gnd and on the wifi shield from left to right: txd, rxd, 5v, gnd, 3v3. rx->txd, tx->rxd, gnd->gnd, vcc-> 3v3. Remeber that the FT232RL board has a jumper to change the voltage. You should use 3.3v. But for me I had some problems flashing, so I actually the the voltage to 5v and then connect the vcc to 5v connector on the wifi board. Never had any problems after that. 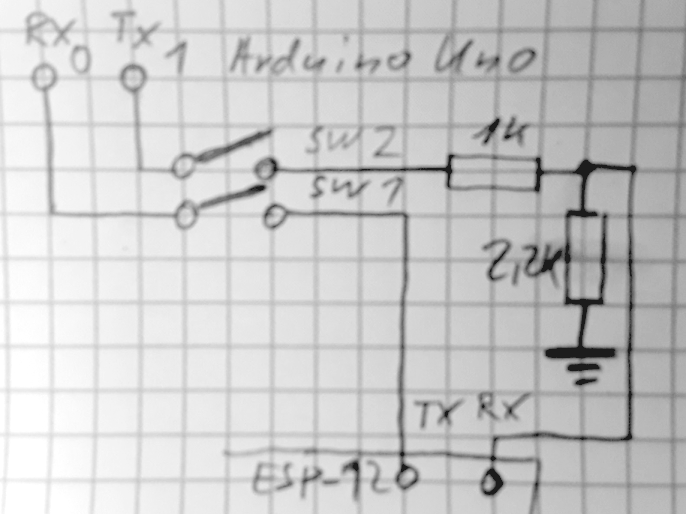 Set all DIP switches "off"
configure the ESP8266 to use 9600 baud using the AT command "AT+UART_DEF=9600,8,1,0,0"
In addition to Andreas' answer, I believe he is correct about the general wiring of the 2 pins #0, #1 for some cheap clones. I got mine to talk to the serial monitor (Arduino) by jumpering over the shield pins directly to the header pins next to the ESP-12E module. This is at 115200 baud and Both NL and CR on the serial monitor. Not the answer you're looking for? Browse other questions tagged arduino-uno esp8266 wifi library or ask your own question. 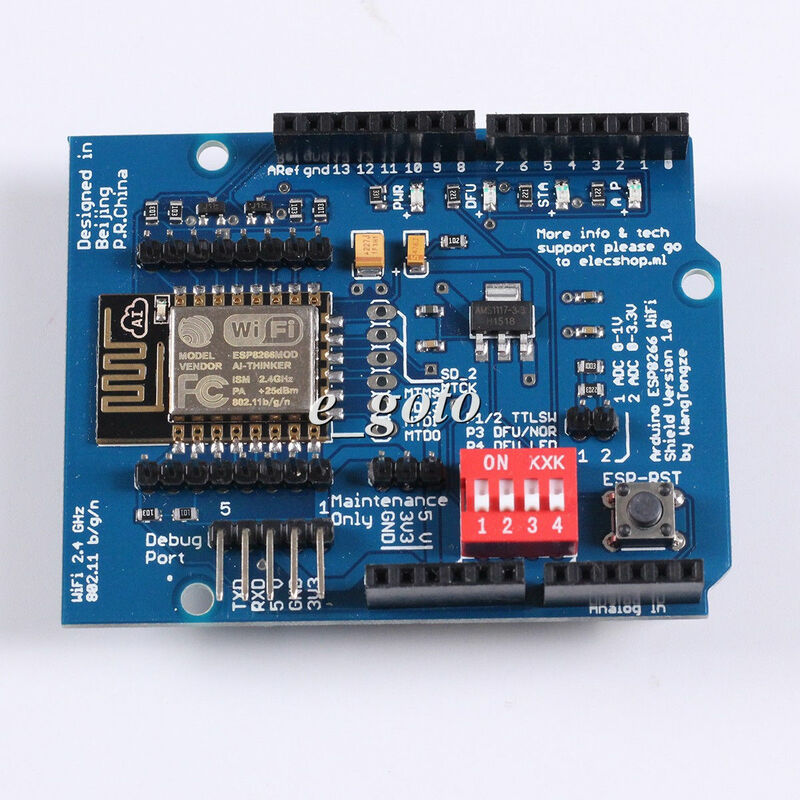 Can I use NodeMCU with Arduino to connect to wifi or do I need a separate module?